I couldn't find an article on CBRForum so in the desire to keep people from looking else wear here is how to set sag, I didn't come up with this method however, this is the process I use and it produces very good results on my bike with stock/Penske/Ohlins suspensions, as well as my friends bikes. No matter what shock or fork you have, they all require proper adjustment to work to their greatest potential. Suspension tuning isn't a dark art no matter what your friends say, and if you follow methodical step-by-step procedures you can make remarkable improvements in your bike's handling characteristics as long as you are precise in your measurements and write everything down!!! The first step to setting up any bike is to set the spring sag and determine if you have the correct-rated springs. Spring sag is the amount the springs compress between fully topped out and fully loaded with the rider on board in riding position. It is also referred to as static ride height or static sag. If you've ever measured sag before, you may have noticed that if you check it three or four times, you can get three or four different numbers without changed anything. Lets get into why this occurs and how to handle it. But first lets gather the needed tools. Cut yourself two pieces of painters tape 1” long, place one piece on your swingarm close to the axle, the other on your tail directly above the last. Make a dot on both pieces; you will be using those dots as measuring points for consistency. If the pieces of tape are not exactly vertical the sag numbers will be inaccurate (too low). Have your first friend balance the bike from the front and have the rider mount the bike wearing all of his gear. Accuracy is important; you must take friction of the linkage into account. First, friend number one will push down on the rear end about 25mm (1") and let it extend very slowly. It's important that you do not bounce! Where it stops, measure the distance between the two pieces of tape. If there were no drag in the linkage the bike would come up a little further. Put this measurement on your notepad as R2. lift up on the rear of the bike about 25mm and let it down very slowly. Where it stops, measure it. This measurement is R3. If there were no drag it would drop a little further. Remember, don't bounce! The spring sag is in the middle of these two measurements. In fact, if there were no drag in the linkage, R2 and R3 would be the same. To get the actual sag figure you find the midpoint by averaging the two numbers and subtracting them from the fully extended measurement R1. Spring collars are common on most shocks, and some benefit from the use of special tools or hydraulic adjusters. If you don't have a spanner wrench you can use a blunt chisel or flat head screwdriver to unlock the collars and turn the main adjusting collar. If you have too much sag you need more preload; if you have too little sag you need less preload. For road race bikes, rear sag is typically 25 to 30mm. Street riders usually use 30 to 35mm. If you are using your bike both on the track and the street than you need to adjust your suspension for your ring conditions, so if you're going to the track than adjust it accordingly, than when you are done change it to the street setup. The firmer settings commonly used on the track are generally not recommended (or desirable) for road work. Some companies make special tools to help measure sag; however with a few friends, a six-pack and an afternoon makes these tools unnecessary in completing this simple procedure. If you a triple tree stand put the bike up in the stands and measure the fork from the dust seal to the bottom of the triple tree, or lower fork casting on inverted forks. This measurement is F1. Take the bike off the stands, and hop onto the bike wearing all your gear, get into the tuck position and have your first friend balance the bike from the rear, your second friend will push down on the front end and let it extend very slowly. Where it stops, measure the distance between the dust seal and the bottom of the triple tree again. Do not bounce. This measurement is F2. Lift up on the front end and let it drop very slowly. Where it stops, measure again. Don't bounce. This measurement is F3. Once again, F2 and F3 are different due to stiction or drag in the seals and bushings. Adjust the preload. To adjust sag use the preload adjusters. Street bikes run between 25% and 33% of their total travel, which equates to 30 to 35mm. Road race bikes usually run between 25 and 30mm. This method of checking sag and taking stiction into account also allows you to check the drag of the linkage and seals. It follows that the greater the difference between the measurements (pushing down and pulling up), the worse the stiction. A good rear shock has less than 3mm (0.12") difference, and a bad one has more than 10mm (0.39"). Good forks have less than 15mm difference, and bad forks can have more than 50mm. 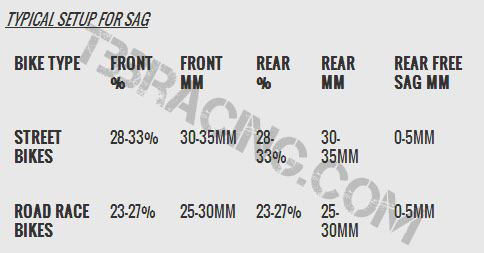 Using different sag front and rear will have huge effect on steering characteristics. More sag on the front or less sag on the rear will make the bike turn more slowly. Increasing sag will also decrease bottoming resistance, though spring rate has a bigger effect than sag. Racers often use less sag to keep the bike clearance, and since road races work greater than we see on the street, they require a stiffer setup. Of course, setting spring sag is only first step of dialing in your suspension, so stay tuned for future articles on spring rates and damping. Last edited by CJardine; 10-27-2013 at 03:04 AM. Yea I was really bummed that I was moving away from him and a few shops around that area, I got my wheel chock at his advice and I gotta say its great, I use it to haul my bike and that thing is solid! I only have to use two straps to pull the rear to the front of the truck and I'm done, Really want to make some hooks to replace the passenger pegs, that's the only reason they are still on. I'm still editing my next write up on adjusting compression and rebound, I like his work and he knows his stuff better than the back of his hand, but there are somethings that I like to do differently, hence this setting sag write up. Setting Sag w/ No Help? Quick Reply: HOW TO: Setting Sag!! !